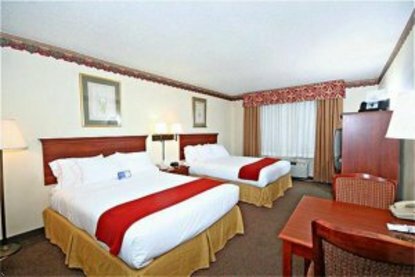 The newest addition along the mountains of southwest Virginia is the Holiday Inn Express Hotel of Hillsville, Virginia, conveniently located to I-77 and Exit 14, Adjacent to Shoney&regs Restaurant. The hotel is located just two miles from the Annual Labor Day Flea market and Gun Show. Special in room amenities include: FREE HIGH SPEED INTERNET, microwave and refrigerator, and free local calls. BUSINESS: Crossroad Institute, Vaughan Bassett Furniture Store, Wilcohess, Tune & Toler and Parkdale Mills. HOSPITAL: Twin County Regional Health Care UNIVERSITIES: Radford University and Virginia Tech University Local Attractions are Blue Ridge Parkway, New River Trial State Park, Annual Fiddlers Convention, Annual Labor Day Gun Show, Foster falls park and Blue Ridge Music Center. This hotel is committed to providing accessible facilities under the American Disabilities Act. If your accessibility needs are not met, please contact the Hotel Manager on Duty. Should you require additional information regarding accessible facilities for guests with disabilities, please call 1-800-Holiday (U.S. and Canada) or contact the hotel directly. For the hearing impaired, TDD service is available at 1-800-238-5544 within the U.S. and Canada.